September 5, 2016 By This post may contain affiliate links. 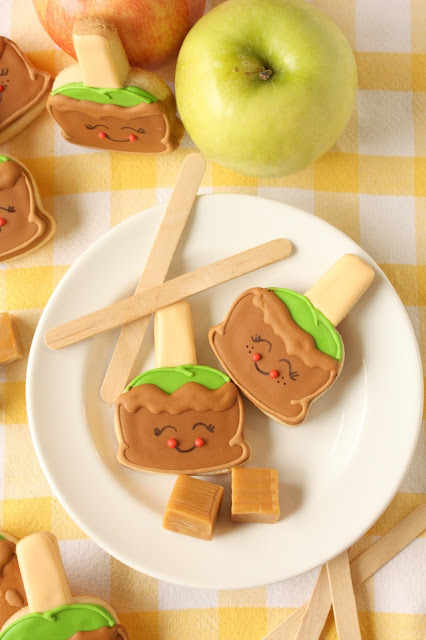 Turn ordinary sugar cookies into adorably cute Caramel Apple Sugar Cookies. 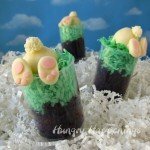 Each of these sweet sugar cookie lollipops is decorated with royal icing and Salted Caramel Candy Melts. Hello! 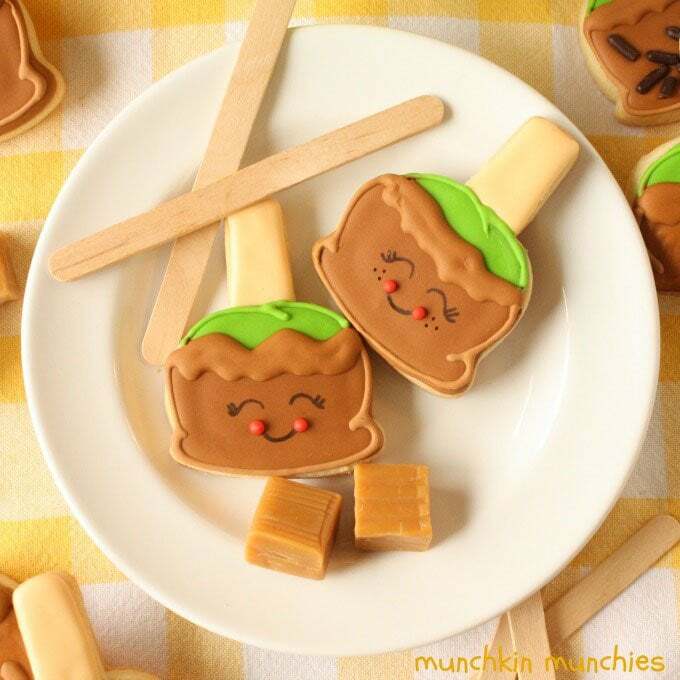 My name is Sue and I blog over at Munchkin Munchies. 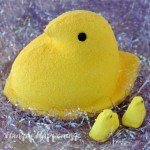 I’m thrilled to be here today, guest posting for the creative and talented Beth of Hungry Happenings! I’ve been a huge fan of hers for years and last month I was privileged to meet her (and other amazing blogger buddies) at a Fun Food Blogging Retreat that Beth hosted. Let me tell you, she is as genuine and fun as I knew she would be! Fall is just around the corner and fall is my favorite season! 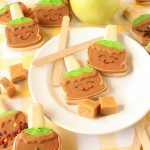 As a food blogger of mostly sweets, caramel is classically one of the stars of the fall treats line-up, and so are apples. I have made caramel apple cookies before, but when I received my mini caramel apple cutter in the mail, I was dying to make them. I had ordered the 3-inch caramel apple cookie cutter thinking it was bigger, not taking into account that the “stick” was figured into that measurement, of course! So when it arrived, I almost wanted to squeal over its mini size! 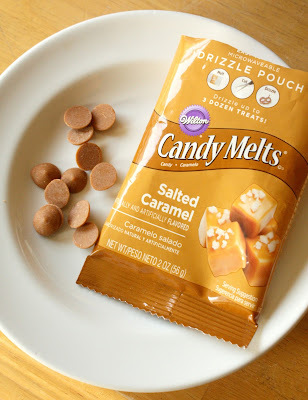 I was given this 2 ounce “drizzle pouch” of salted caramel candy melts (new Wilton product) at the retreat (Thanks, Jill! :)) and thought it would be perfect for icing some of the cookies, though most of them were topped with caramel colored royal icing. 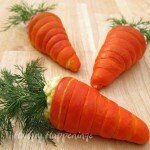 They were really quite simple to make! As you can see, I first iced the sticks with ivory tinted royal icing, and allowed it to set for about 15-20 minutes before adding the green apple icing (a mixture of leaf green and a bit of gold). The green icing was given about an hour to dry to avoid “bleeding” with the caramel colored icing. I added the caramel colored icing to the rest of each apple and let them dry overnight. I also used the candy melts to cover about six of the little apples; they dry quite quickly. In the morning I added the caramel apple details with the royal icing by outlining and adding the dripping caramel to give them more dimension. I then outlined the green apple detail. Lastly, the facial features (eyes and mouth) were applied with food markers. The cheeks are red royal icing. 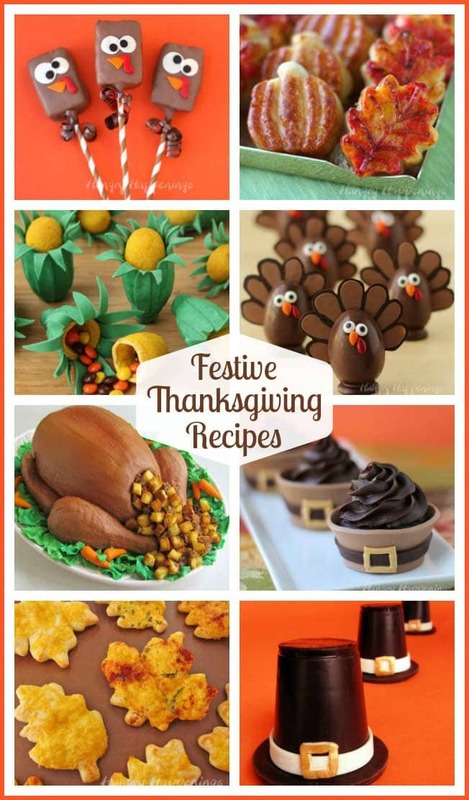 The apple in the bottom left corner is one of the cookies iced with the candy melts. They were really tasty, but I couldn’t resist putting the faces on the rest of the bunch! Markers don’t work on the candy melts, so next time I may just try using royal icing on them for facial details. 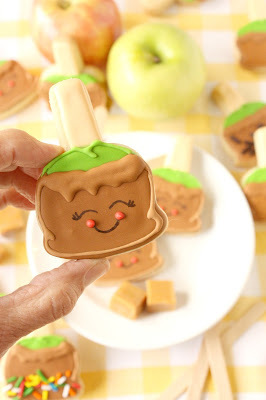 These Caramel Apple Cookies are so delicious you won't be able to get enough! 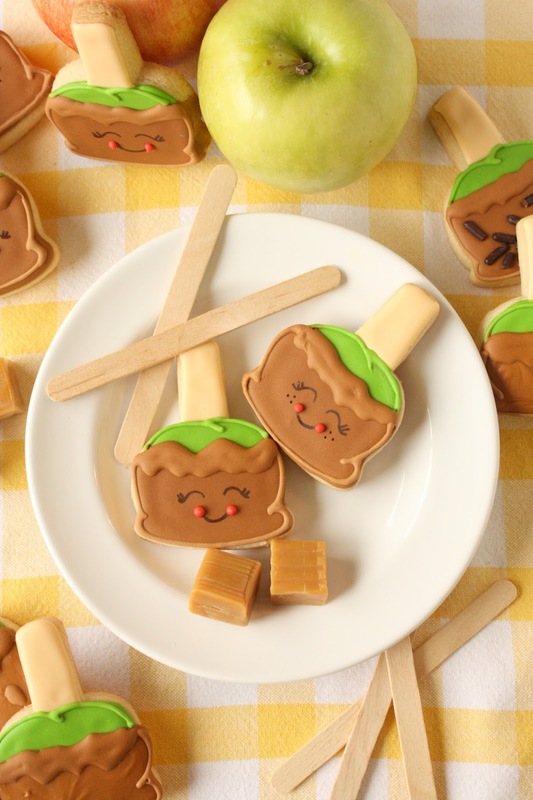 They are adorable and fun to make, and they're even better than real caramel apples. 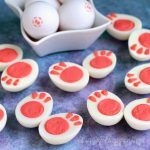 I use Wilton and Americolor gels, depending on what colors I need and have on hand. Roll out your cookie dough (I chill the dough first) and cut out cookies with the cutter. With a spatula, place dough pieces on the parchment lined cookie sheet. 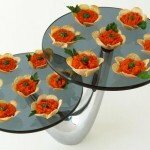 I usually place the cookie trays in the freezer to help the cookies hold their shape. Let cookies cool for about 10 minutes and then place on a cooling rack. Fill a decorating bag with the ivory tinted royal icing, thin enough to fill the "stick" section of the cookie, and fitted with a #2 tip. Let it dry for about 20 minutes. Fill a decorating bag with the green (leaf green with a few drops of gold) royal icing and a #2 tip, and apply it the the top section of the apple. Let it dry for about an hour. 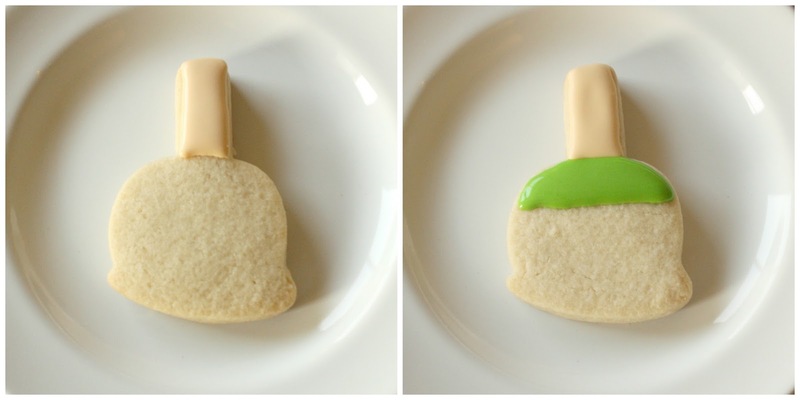 With the green icing and a #1 tip, outline the apple details. With the caramel icing and a #1 tip, add the caramel details. Use the food marker and add facial details. Finally, add the cheeks using the red royal icing and a #2 tip. 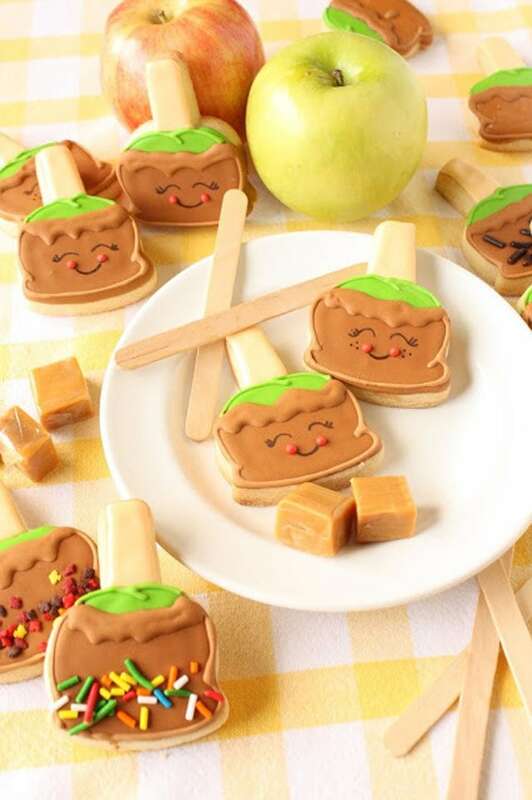 Have fun making your own Caramel Apple Sugar Cookies. 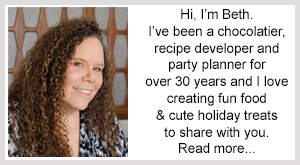 Thanks for having me over at your fabulous blog, Beth! 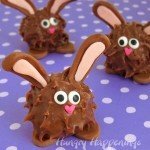 These are sooooo CUTE, Sue! Perfect for Fall.